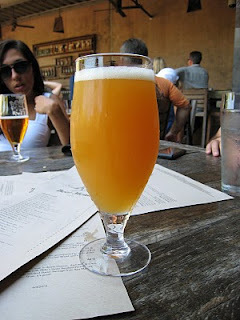 This was my second beer at the Stone Brewery. I wanted something summery since it was mid 90s out, and the Lightning Thunderweisen had the most manly name every for a beer. And after taking my first sip, I'm pretty sure Zeus made this. And he probably uses it for lube. And he uses it to drown people that piss him off. Death by tastiness indeed. The color looks like orange juice, and has a small amount of head. It's unfiltered, has a decent citrus blend (mostly lemon) and has a bitterness profile that you would never have in a hefeweisen. I definitely need to take a trip to the Lightning Brewery just because of this.